The Waikato laboratory determines C14 activity through the measurement of beta particles. Samples are converted to benzene through hydrolysis of lithium carbide and catalytic trimerisation of acetylene. 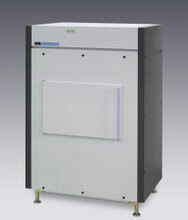 Residual radiocarbon activity is measured using ten Perkin Elmer 1220 "Quantulus" Liquid Scintillation (LS) spectrometers. The "Quantulus" is the most sophisticated low-level spectrometer available. It has extensive shielding designed to reduce the effects of background radiation, enabling both older and smaller samples to be dated more accurately. The instrument also contains twin multi-channel analysers (MCAs) which provide information on the sample and background spectra, necessary for quality control. The Waikato laboratory is the only one in the world with ten spectrometers of this type. More details on Liquid Scintillation Counting and LSC by Quantulus are given in the Radiocarbon WEB-info pages.